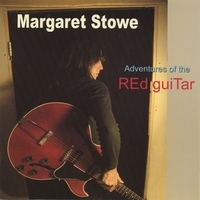 An instrumental guitar CD featuring just Margaret on guitars and effects. A collection of originals, improvisations and interpretations of familiar tunes from here and there, with the theme of unstress; a mellow respite for your enjoyment. Great reviews! Read great reviews! Modern groove jazz and world folky blues. Featuring guests including Harry Manx, Richard Underhill, Kathryn Moses and Daisy DeBolt. An eclectic CD.